This 100 % cotton 9.2 oz canvas has been sanded for an antique artisan finish. 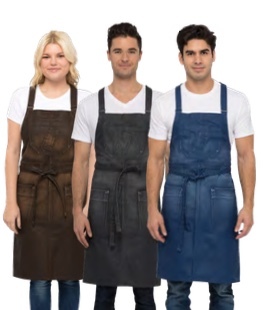 This sturdy apron has both a chest pocket, and 2 hip pockets and features adjustable cross back ties with snap tabs. 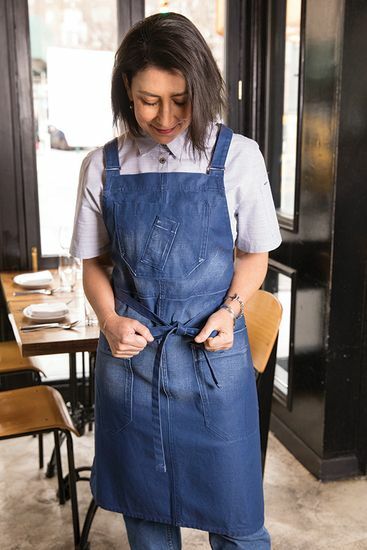 This apron is functional for the kitchen and perfect for the new urban chic style of today's modern uniform trends and hip restaurant scene. Custom embroidery for this apron is just a click away. Simply check the box next to "Embroidery $5 per line" and an entry field will drop down, allowing you to select an embroidery font style, thread color and enter up to three lines of text. 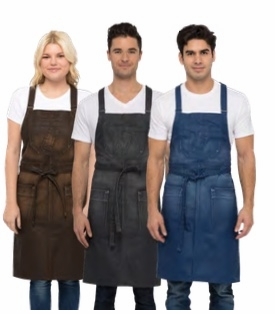 Corporate logo embroidery for your restaurant is also available, please click here to Contact Us for details on this service.